ELSAG's ALPR systems scan license plates in real time, so your operators receive immediate alerts of any hot or white list matches. Instant data lends your law enforcement the edge on offenders, aiding in your duty to stop crime and promote community safety. ELSAG's Mobile Plate Hunter M6™ represents the sixth generation of our mobile Plate Hunter. These automatic license plate readers (ALPRs) are the most advanced systems on the market today. Our modern mobile ALPR systems benefit law enforcement agencies, parking authorities, toll operators and access control organizations looking to enhance patrol presence, add a force multiplier and improve efficiency. The Plate Hunter M6™ minimizes the guesswork and safety risks that challenge enforcement personnel every day. This highly advanced mobile ALPR system reads plates day or night, in all weather conditions, and from all 50 U.S. states as well as most foreign countries. The upgraded features result in a more effective and affordable product, with the improvements reducing the overall cost of the system by 25%. 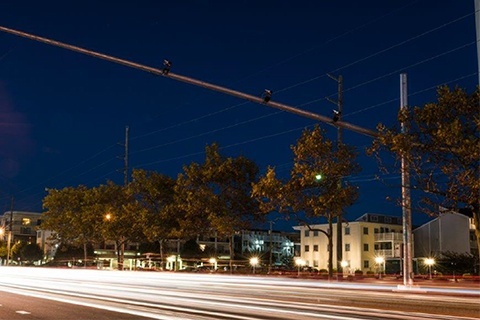 ELSAG's Fixed Plate Hunter F2™, our second-generation fixed camera, and the new H6™ automatic license plate readers (ALPRs) feature the most sophisticated technology for critical infrastructure protection, ongoing investigations, real-time traffic monitoring, access control and toll collection. A fixed ALPR camera is mounted on to key arteries and highways, bridges, tunnels and overpasses to monitor set locations. 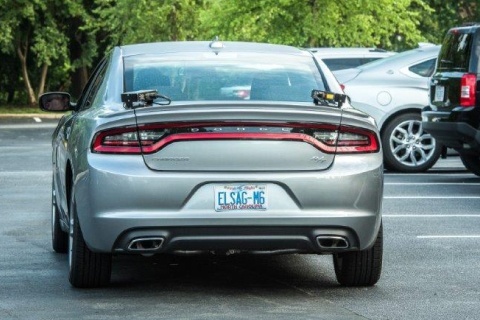 License plate data is captured 24/7 and the system remembers everything it sees. The Plate Hunter F2 and H6 fixed ALPR systems are critical tools in identifying traffic anomalies, criminal investigations, access control and toll collection. The F2 and H6 fixed ALPR systems read plates day or night, in all weather conditions, and from all 50 U.S. states as well as most foreign countries. 1. The Plate Hunter F2 fixed ALPR system is the most accurate fixed automatic license plate reader available to constantly monitor sensitive areas. 2. The F2 has digital cameras — featuring built-in processors, a field control unit (FCU) and proprietary software — that capture images of license plates and cross-check each with hot lists to identify vehicles of interest. 3. Alarms are broadcast in real time to a command center, patrolling vehicles and/or mobile devices, for immediate reaction. 4. Plate Hunter F2 also determines a vehicle's speed, providing data that helps to identify traffic patterns and automatically detect real-time traffic anomalies, such as jams, stationary vehicles on open traffic lanes and other dangerous occurrences. Fixed and mobile ALPR systems easily adapt to custom solutions by concealing system components in an apparatus or compartments that fit in naturally with their surroundings. We continually work with partner agencies to develop creative ALPR custom solutions that address specific needs. 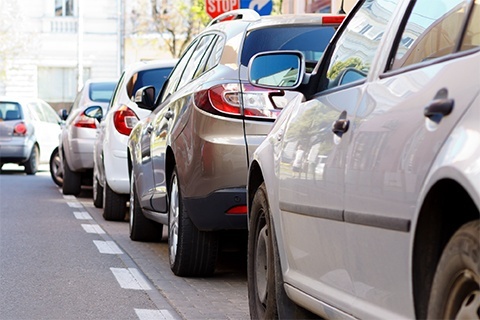 These clever systems read license plates without drawing attention to overt hardware and help identify vehicles connected to auto theft, parking violations, toll evasion, insurance lapses and more. 1. Each of our ALPR custom solutions houses all components needed for full performance and accuracy – cameras, sensor, processing unit and independent power source. 2. 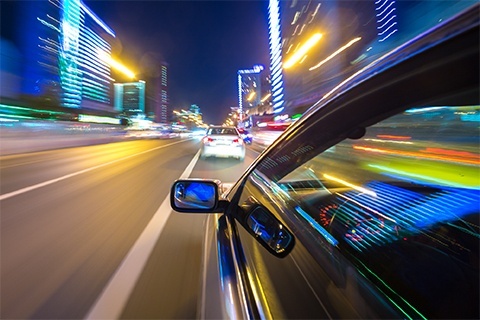 Each system reads license plates day and night, in any weather, capturing plate numbers, photos of the car, GPS coordinates and date/time stamps. 3. Data captures are automatically compared to hot or white list databases to identify suspect vehicles. 4. Alarms for suspect vehicles are instantly broadcast wirelessly to a command center, laptop or PDF smart phone. ELSAG's back-office Enterprise Operations Center™ (EOC) software gathers all ALPR data coming from an entire fleet of ELSAG mobile ALPR units and/or a network of ELSAG fixed ALPR systems, while also managing the distribution of hot and white lists back to systems in the field. This advanced software is the brainpower behind ELSAG's Plate Hunter ALPR intelligence assets. The EOC software includes an intuitive website that allows authorized users remote access to data, as well as reliable technical support services that troubleshoot issues 365 days a year. 1. Tools for data mining, analysis and monitoring. 2. Mapping with cross-street locations. 3. Permissions at domain, group and user levels. 4. Audit trail for visibility of data sets and use of system. 5. Hot list manager limits visibility of specific hot lists. 6. Easy process for adding cameras. Crashes in work zones led to 669 fatalities in 2014. Speeding was a factor in 28% of all fatal crashes. ELSAG's ALPR SpeedEnforcer™ software helps create safer environments for everyone on the road, including people who work on busy roadways. Using a simple calculation for speed over time and distance, SpeedEnforcer is a valuable tool to identify speed violators and make specific zones along a roadway safer. 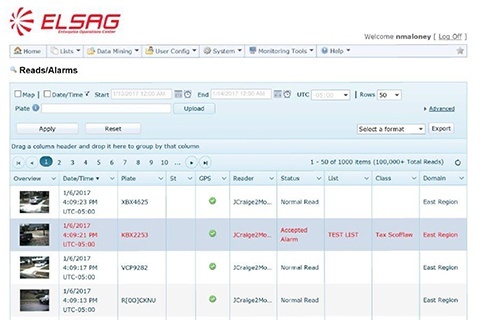 This license plate reader software application identifies speeding vehicles between two fixed points and alarms officers ready to interdict or triggers an automatic ticketing process. 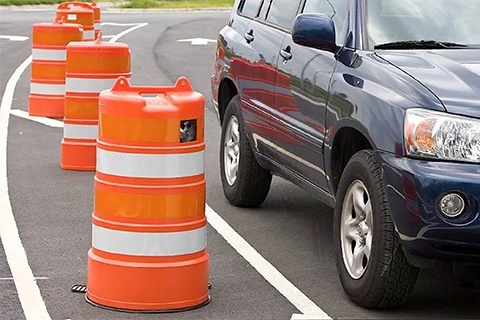 This application is perfect for construction zones where enforcing lower speed limits is difficult or along roadway stretches where the speed drops but many motorists keep traveling at the higher speed. 1. The system has two mobile or fixed Plate Hunter ALPR cameras per lane of coverage, a central server and specially designed software. 2. The first camera reads license plates as vehicles enter the zone. The second camera reads the same plates as vehicles exit. 3. SpeedEnforcer calculates the speed of each vehicle traveling inside the zone based on entry and exit times across a specified distance between the cameras. 4. Each read taken by both cameras includes the license plate number, speed, photos, data and timestamps, GPS coordinates and any alarms generated. Whether your parking operation is across an entire municipality or you have an independent parking operation with a handful of lots, the daily management and enforcement requires manpower and time to survey streets, lots and garages. ELSAG's ALPR Parking Software™ will add a force multiplier within your operation. ELSAG's ALPR Parking Software is the most effective and efficient means of parking enforcement. Designed with modules for time and permitting applications, the software helps to significantly reduce the time and resources you currently spend on parking management. 1. "Electronic chalking" marks a car when someone parks in a timed zone. Two ALPR reads at the same location creates an alert for parking enforcement to issue a ticket. 2. The software interface runs ALPR camera captures through a ticketing system to identify time enforcement and permit violations, issuing tickets when there's a violation. 3. Uses Automatic License Plate Recognition cameras, GPS, time/date stamp and proprietary back office server software to identify vehicles which have violated parking regulations within a specific area. 4. Ability to integrate and correlate data from multiple enforcement vehicle. 5. Non-parking related vehicles can passively send data to a parking enforcement officer. 6. ParkingEnforcer software can be used with existing ELSAG Mobile Plate Hunter ALPR systems. 7. Administrative control through central dispatch and monitoring. 8. Dispatch capabilities to prioritize enforcement agents' activities and resources on high volume areas. 9. Zone prioritization based on geography and agents in the field. 10. Ticket Agent View is independent of Car View allowing patrol vehicle to keep moving while enforcement agents on the ground issues violations.